Belfryboy. Hi, just wanted to say my datalogger you supplied sometime back now (the original vue one) is still working great! Good luck on the new updated version mate. And I got the new version of the logger in the post this morning. Excellent news! this really does pave the way for more loggers to be produced. I am awaiting some boards from OSHpark, and I have uploaded the boards to the shared project area so that anyone that wants the bare PCB can order it direct from them. alternatively if anyone would like me to build one for them I am willing to do so. Price remains unchanged at £55 including free tracked postage worldwide. Just send me a Personal Message and send you more information. Also wanted to add that I received on of the loggers that travisc made. Got it up and running this last week. I am using 3.12 firmware on my 6153 and everything is working great. Thanks! to everyone that have made this possible. I've recently been upgraded to a Davis Vantage Vue, and I've been spending a LOT of time here researching my options to get my WX data online, and just signed up. First, I want to say thanks to some of you guys here for some of the EXCELLENT information on that front. DeKay (Awesome blog! ), torkelmj (VERY good job on the technical papers! ), rdsman, SLOWeather, and belfryboy have been especially helpful. Thanks guys! Anyway, the last time I looked at upgrading to a Davis was before the dreaded v3.0 firmware, and now that I have one, I see what has happened. I think it is total bull that Davis would stick it to their customers like they have with 3.0. For that reason alone, I WILL NOT buy any of the Davis datalogger options, which led me to this post here. I just need a little bit of clarification though. Is the datalogger linked above in belfryboy's post the USB or Serial version? I'm not 100% sure and both have been discussed at times in this thread. I'm looking at going with Meteobridge and that logger for ease and portability. I have a Raspberry Pi I had been thinking about trying to use, but in the end the two solutions are about the same cost, and I like the idea of keeping the weather station stuff separate from everything else on my network. Thanks in advance! The belfryboy logger is USB but using the FTDI chipset so appears as a virtual serial port. 2 recent sales were to RaspberryPi users running Weewx. I do also make a serial version as well for the same price. Thank you for the reply Rob! The part I don't personally like about using the RPi is that I'd have to set up some kind of wireless solution between the RPi and the Vue (XBee's or other), plus integrate it with some of the other stuff my RPi is doing on my network. (That is, until such a time that the RPi can emulate the Vue console directly listening to the ISS, which sounds like it might not be too far off.) I'd like to try and keep the weather stuff "isolated" from everything else if possible, for a few reasons. 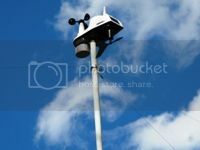 The Meteobridge solution makes all of that pretty easy, and has the side benefit of a reasonable one-time payment for the upload/distro software, and an easy-to-use GUI (I despise programming). A virtual serial port via USB is exactly what the TL-MR3020 wifi router is expecting too (based on my current understanding of what I've read so far). Thanks again folks! With any luck, I'll have my station up on the 'net soon! Maybe another dumb question for belfryboy - Is your current logger design USB 2.0? I've assumed it wasn't, but have been reading in my Meteobridge research that some of the newer Davis USB loggers are now USB 2.0. TIA. Hi guys, does this belfryboy data logger works with Davis Vue us version with 3.0 firmware? if it works what is this cables main advantage or disadvantage to the original Davis one?can it be used with Weatherlink and can it be used with meteobridge router? akkasoglu, take a look at my signature right above (and now below) your post. It answers almost all of the questions you asked. The logger/cable does everything the Davis one does, but is a bit less expensive, and you're not supporting Davis' price gouging of their customers for peripherals. Well that's the first 9 built and bagged to be shipped tomorrow! Thanks to all those that ordered early for all your patience , I appreciate in the internet world that purchases usually turn up within a day or so. I will supply tracking details for each order as soon as I post them. Next batch of boards have been ordered, I expect they'll arrive in a fortnight or so. You'll have a factory in China cranking them out before you know it! Then they would cost about 1/3 or less. Take a look at radio control aircraft receivers to see what I mean. I have just joined WX. I bought a VP2 several years ago but for various reasons it was only commissioned in last year. My primary aim was to log the local weather as we have suffered a number of weather related floods in the past 10 years. I have been having a dialogue with the local authorities who have designed a flood defence based on a 1 in 100 year event. Total crap as their models suggest we would not flood. Our problem is the peak rainfall intensity which matters more that a 1 1n 100 event. We had two consecutive years of flooding which was a flash flood event with the water gone in a matter of hours. I escaped but some neighbours got water in their properties. I have now 2 VP2's operational. One in a field that I own and another on the house roof. My efforts with the data logger have been a disaster. I think WL is an abomination, and Davis a real disgrace the way the support the software for Mac users. I have done all the fixes, 32 bit, Sillabs driver, etc. I have tried Weathercat as well. I have a functioning meteobridge to transmit the data to wunderground. The only thing that works is the meteobridge. Wundergoround is connecting with meteobrdige (another story) but there is no data being transmitted . This also applies to WL and Weathercat. Both cannot connect to the weatherstation data logger and receive data. The Firmware on the first VP2 is 1.9 and the data logger is 2010 vintage with no green dot. Meteobridge has a useful message log. It is trying to connect with the logger but eventually times out. Boris at Meteobridge and myself think the data logger is kaput ( fantastic quality). Does anyone else have any ideas? Needless to say I have been in contact with Belfryboy. Davis are not exactly top of my favourites with their crappy support. Last but not least my field of work is a long way from weather. I am a petroleum chemist and I specialise on oil and gas matters, refining and petchems. If I can help someone I will do my best, but it is a bit off base. You didn't specify which logger that your have. Did you try sending "TEST" at the appropriate comm settings? Sorry, usb.logger and I downloaded the latest silicon labs driver. I tried the Test function on WL but nothing happened. It was not clear if this was for the USB serial or the dial up. Do you have the logger set to serial mode. If not it will not work with any software except WL. Did you try tcp mode? If you initially set the logger up in USB mode you must run the special utility to reset it to serial mode. Beau dog, thanks for the reply. I am now travelling untilthe end of the week, so I cannot look or do anything until then. From recollection when I went through WL setup there was not a serial usb choice. Maybe I am looking in the wrong place. The options for connection were Bluetooth? And the slab uart usb. I do not think there was a tcp mode in the menu. I usually can sort these things out, but this has stumped me. The mac WL is pretty poor in terms of instructions and help. Davis are not up to date with the drivers and finding the 32 bit fix was down to Google. If you can point me in the right direction I will have a go. It is certainly possible it might be in serial mode but how do I check and fix it. In the Wl folder>support>utilities is a program called CP210X USB to Serial Converter. If you run this program it will set the logger to serial mode. I am not a MAC user so I have no knowledge of MAC specific programs. But my WL has a setup page like this where I can choose serial, USB or TCP. This particular WL is running in TCP mode across my network. Hmm I just read the WL instructions for a MAC and I can't tell which mode you need to be in so I may be way off here.
. Boris at Meteobridge and myself think the data logger is kaput ( fantastic quality). Does anyone else have any ideas? Isn't the logical first step to verify whether the logger is "kaput"? Two reasonable ways would be: (1) take it to a friend who has a Windows computer and is willing to download the Windows version of WeatherLink, to see if that connects; and/or (2) take/send it to your nearest dealer for testing. Dale coy, thanks for the reply. In retrospect it might have been better for me to start a new thread. But, when I started trying to solve my problem I came across this thread and some earlier ones on the DIY solution. As week as the list of problems and others who feel Davis are taking advantage with the logger. Firstly the dodgy logger is a genuine Davis installed with their instructions and the wrong driver to start with. Correct driver now installed and the 32 bit solution applied to WL. The dodgy logger has been posted to belfry boy for testing and I have purchased a belfry boy logger which will connect with the meteobridge to WU. For me this was a very informative link. I did not understand everything but I really appreciate your efforts, and most of all your help. I am just mad as hell at the cost of the logger and the woeful Davis back-up. If it worked out of the box, as it should it would not have been so bad. By the way the original supplier went bust. I imported my second VP2 from the US at a massive saving even with the freight and duties. By the way the original supplier went bust. So, perhaps a bit of your anger might be directed at that supplier who didn't provide support? [Yes, ultimately the manufacturer has responsibility, too]. I imported my second VP2 from the US at a massive saving even with the freight and duties. Understandable. And hopefully that supplier will provide timely and responsive support if you need it. My USB interface/logger from you should be here tomorrow! Yay! In preparation for the last step in my setup, I have been doing some further reading, which led me to another question. Do I have to go into the logger via a terminal editor like Realterm to set up the logging capability for your logger? there is quite a lot of useful info there, but it was written some time ago, so please feel free to make suggestions as to how it could be improved. Excellent, thank you mate! Will go have a look at it once I get home from work. Really looking forward to finally getting this last piece of the puzzle into place!